The University of Kent could soon have a 250ft statue of Margaret Thatcher erected outside it, if Kent Conservative Society gets their way. The society has lodged plans for the students union to build the giant sculpture (made of iron) outside of the University's nightclub, in order to encourage "sensible behaviour". Whilst it's not clear that the statue would encourage good behaviour, not a single miner has been spotted at Kent since the move was announced. The student conservative group want the statue of Margaret Thatcher to be "placed on a 50 foot-high white marble pedestal in the square across from the University's nightclub, The Venue" in order to intimidate anyone leaving the nightclub from behaving badly. "The statue would be built in the Graeco-Roman style and its design inspired by the Colossus of Rhodes" they say, because of course it would. They believe that the Iron Lady, which would be taller than the Statue of Liberty, would be "a real positive for Kent." "The signatories call for the construction of a 250 foot (76.2 metre). 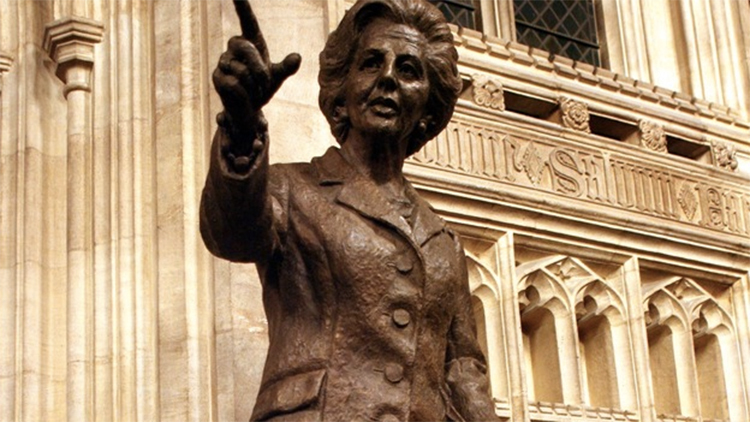 Iron statue of the Iron Lady - Margaret Thatcher, that would then be placed on Campus. The statue would be built in the Graeco-Roman style and its design inspired by the Colossus of Rhodes (one of the original seven wonders of the world). The statue would be placed on a 50 foot (15-metre) high white marble pedestal in the square across from the Universities nightclub, 'The Venue'. The placement across from the nightclub would encourage good and sensible behaviour under the gaze of the 250 foot Colossus. Appropriately the statue would be constructed almost entirely of Iron at a 46:1 scale. At this scale the Iron Lady's handbag would be approximately 30 foot tall. The plan is to construct the handbag of a highly polished Bronze. Strategically placed this would allow the sun to reflect off the handbag at certain times during the day. The statue would then serve the purpose of being a literal 'shining testament to liberty'. While the ingenious polished Bronze handbag would also allow the statue to dazzle the eyes of those lefties who would the Colossus." "A complete waste of time"
The petition to create the giant Margaret Thatcher erection may just be a way to annoy the student union, who are forced (just like parliament) to debate any petitions that get enough signatures. In 2013 a similar petition was debated by the Kent Union, with then Sabbatical Officer Matt Harris called the debate “a complete waste of time”, after several lengthy debates on the topic, with many Kent students speaking for and against the statue. For some reason in 2013, the statue was to be made of bronze. At 250ft (76.5m), it would stand taller than the Statue of Liberty – and the bronze handbag alone is set to stand a whopping 120ft – taller than six London buses. The Kent University Conservative Association Emilio Kyprianou is pressing ahead with plans to get the much bigger iron statue placed at the University under his tenure, hoping that the polished bronze handbag would serve as a "shining testament to liberty" but, perhaps more importantly to him, would "dazzle the eyes of lefties." The University of Kent has declined to answer any of our questions on Margaret Thatcher erections.